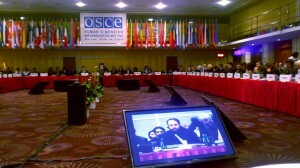 The Organization for Security and Cooperation in Europe (OSCE) held its annual conference on the human dimension implementation from September 23 to October 4, 2013, in Warsaw. It was attended by representatives of the OSCE region including the EU, the Holy See, USA, Russia and the CIS countries. Among the participants was Hierodeacon Roma (Kiselev), DECR secretariat for the far-abroad countries. On September 26, he addressed the sixth session of the forum on Freedom of Religion and Beliefs, speaking on the Russian Orthodox Church’s position on the situation in Syria, the persecution against Christians in the Middle East and Africa and Christianophobia.